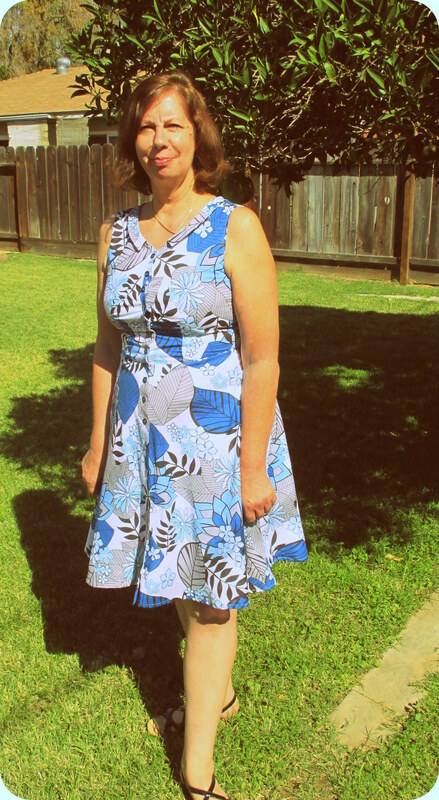 No, not a dress for my momma as she’s a boots and jeans girl, but one for my other momma, my mother-in-law, Alana! 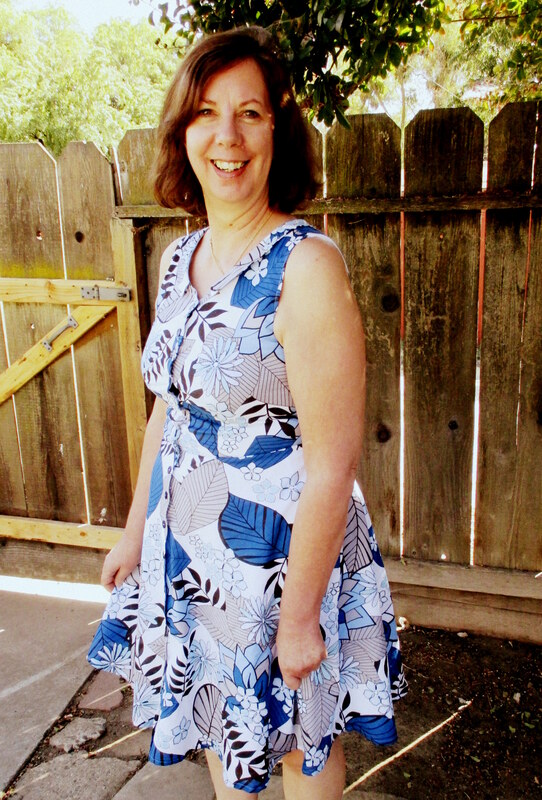 My MIL, Alana, is my partner in fabric and pattern shopping and I am lucky to have her. Without her, I don’t think I would have progressed into sewing my own wardrobe. 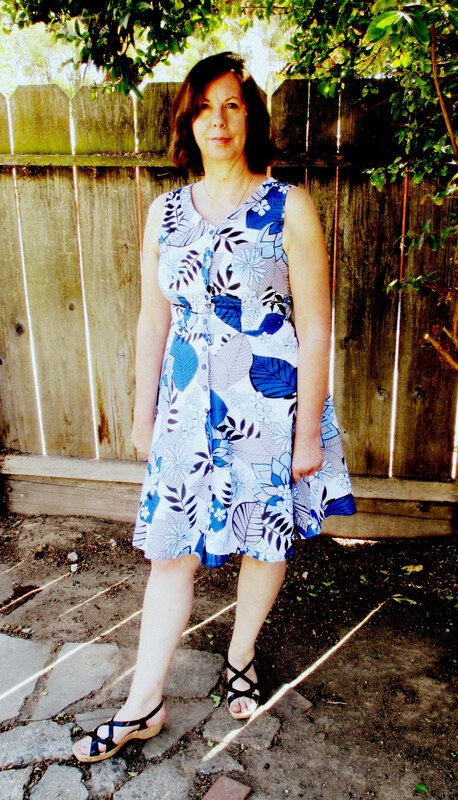 I have been sewing most all of my life, but usually only for special occasion wear, costumes and home decor. For the last few years I’ve been filling my closet with my “me made” garments and wearing unique clothing as I build my dream wardrobe. I’ve learned more from her than any class could teach me and she is always there to ask for advice or opinions. Besides making clothes for herself and grandkids, her business is making couture garments for fashion dolls (Doll Fashions by Alana). She makes incredibly gorgeous costumes from films and historical recreations. She has made me outfits for my Scarlett O’Hara Barbies and recreated Brian and my wedding outfits on both Tonner dolls and mini dollhouse dolls (that were cake toppers). The clothing she makes is spectacular with a fine attention to detail. You can also see more of her makes on her facebook page. 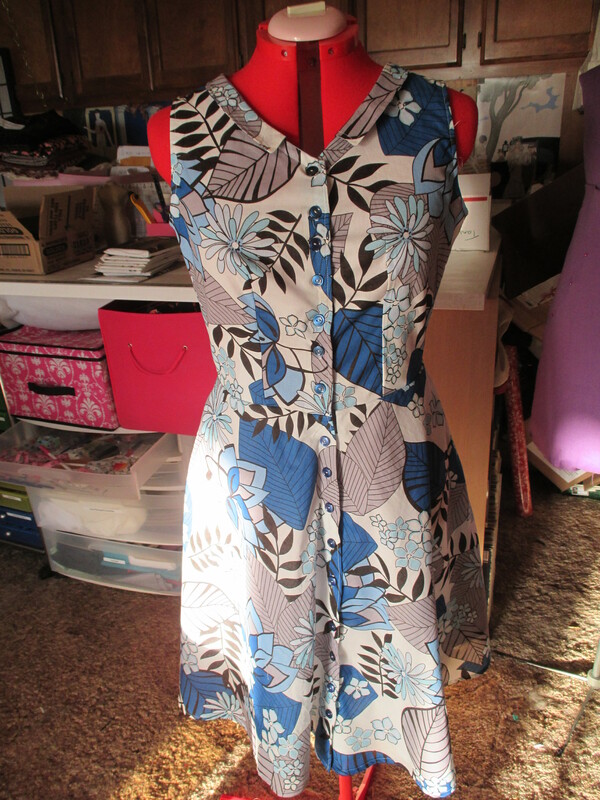 This is the first dress that I’ve made for Alana (and not the last!). 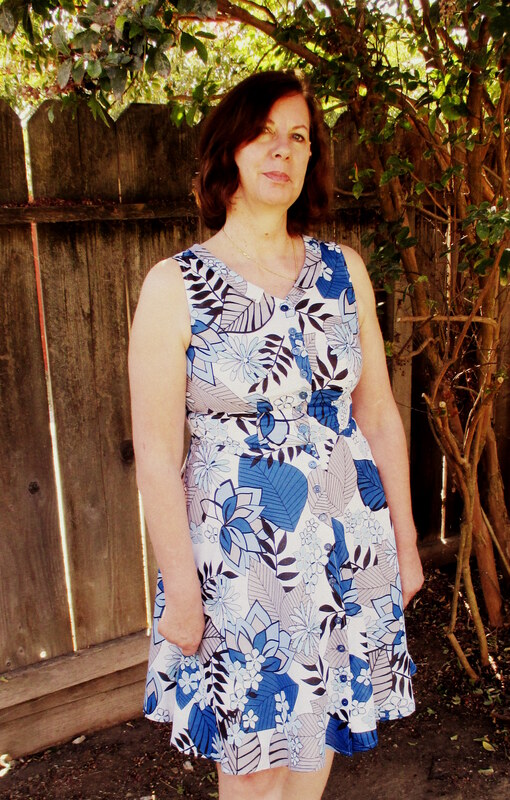 It is made out of a jungle print cotton lawn that I also used to make this dress. We both purchased this fabric from Fabric Mart several months back. Yes, we have similar tastes! 🙂 The pattern is the Colette Hawthorn, which I’ve also made before. This Hawthorn definitely turned out better than the last as I know what I like and don’t like about the pattern. I also have been doing a lot of buttonholes, so I’m pretty accustomed to that now. I still prefer making them on my old machines rather than the automatic buttonhole feature on my new machines, but I haven’t dragged out the old Pfaff or Kenmore yet to do that…. The cotton lawn is underlined in the bodice and lined in the skirt with blue cotton batiste. 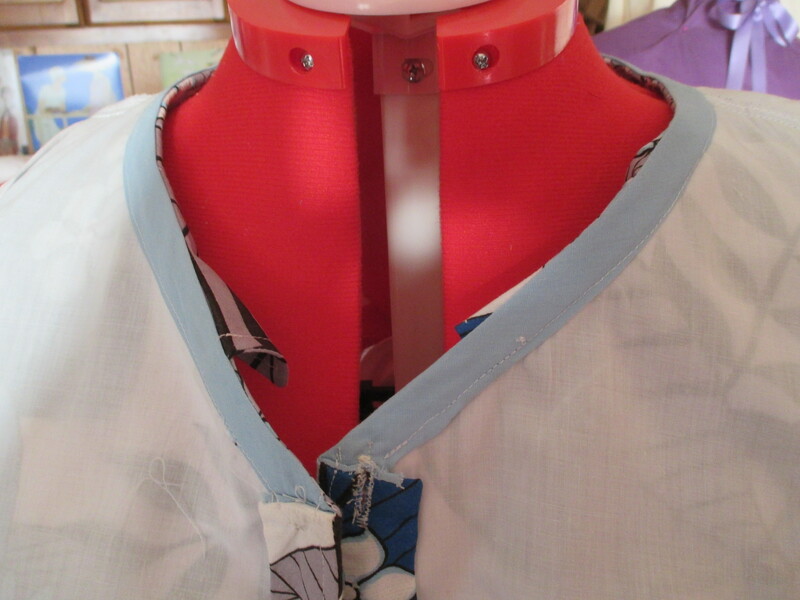 I really did not like the collar facings in this pattern, so I omitted them. Instead, I finished the edge with bias tape and turned it under and then top stitched. 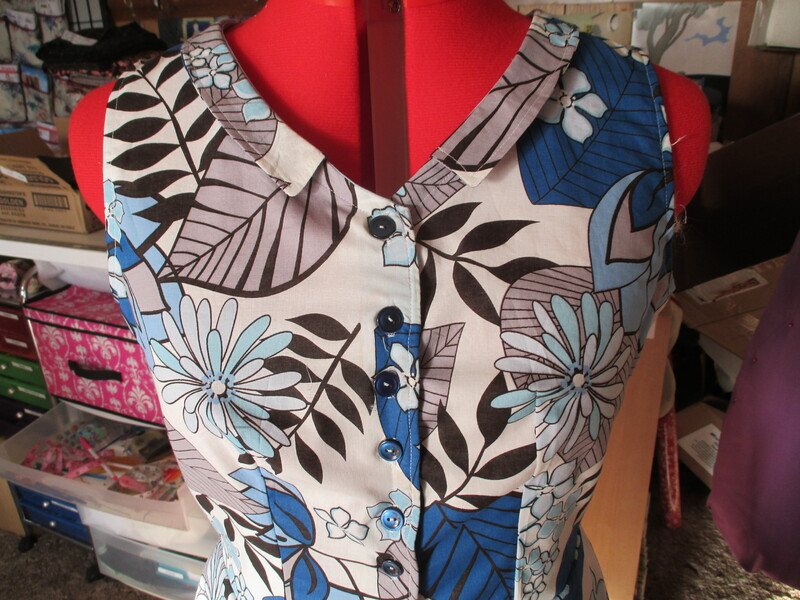 I made my own facing for the button placket on the bodice and added more interfacing, as I decided that that was what was missing in my first Hawthorn. As I had recently made a couple of men’s button down shirts, I used some of my knowledge from sewing those. I apologize for the lighting on the interior dress photo below. My light was waning when I took these on my dressform. 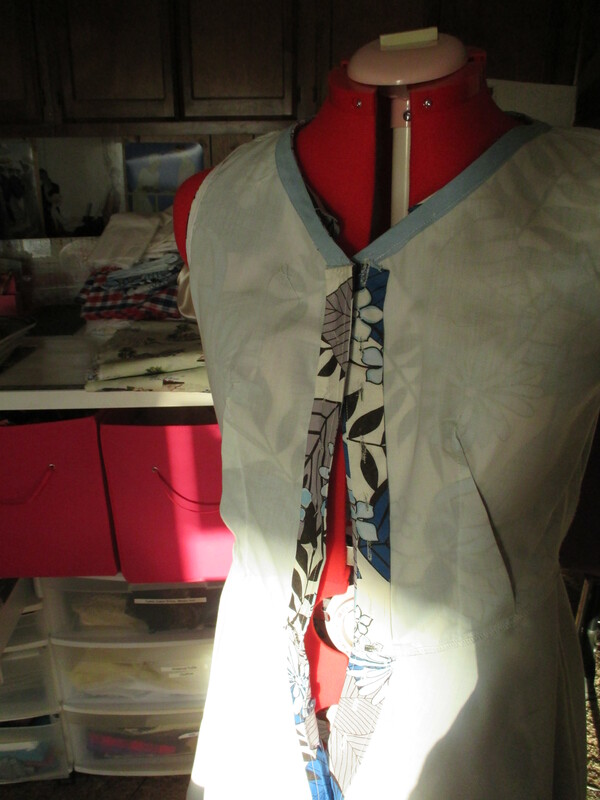 When I make things for other people, I’m never certain how the garment is going to fit until they put it on. Thankfully, this dress fits perfectly!!!! And, even better, Alana likes it and has worn it already! I’m glad I finished this while it’s still warm here in Northern California so that she can wear it now instead of waiting until spring. I am currently working on another Hawthorn for myself in turquoise gingham with short sleeves and am planning a navy cotton sateen one with 3/4 sleeves as well as couple of Hawthorn blouses. I just love a pattern that can be re-used! 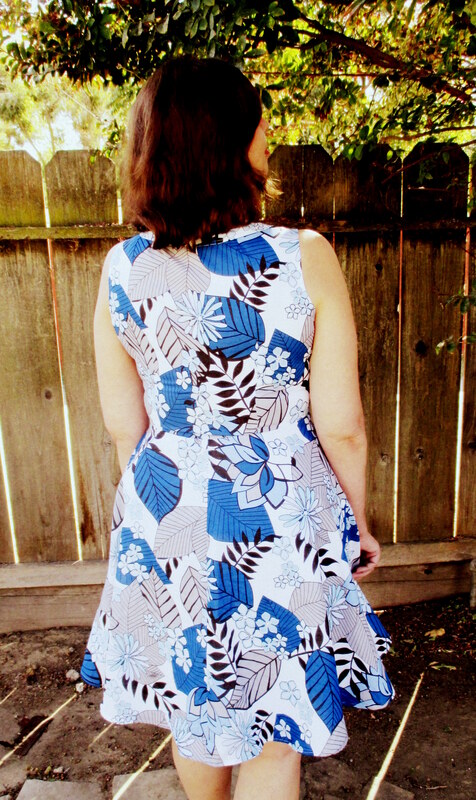 I was going to start grading up my 1952 Simplicity peasant dress pattern before it got too chilly to wear that dress, but I thought since the Hawthorn pattern was still out, may as well use it! 🙂 Now I have another item marked off my sewing list! Beautiful dress! Great pattern/fabric pairing too. You know, I bet she really appreciates you making this for her — I think we don’t really consider sewing garments for others who sew, but it’s really a lovely sentiment. Awesome choice of fabric! That print is to die for! Sarai and her team at Colette have turned out great fitting patterns and the Hawthorn is no exception. Weather in Indiana has turned to fall so I have stored mine but have on the table the Zinnia skirt pattern awaiting its turn. Your dress is so wonderfully sewn, I love when the inside of a garment is as neat as the outside. Thank you! 🙂 I love Colette patterns. So beautifully made and well thought out.